There is a good reason to believe Habakkuk 2:2-5 from 610 BC is a prophecy about Paul and Paulinism. While we have all been taught to see this passage is teaching about justification by faith, this is incorrect. Paul pulled a verse out of context when the words "the just shall live by HIS faith" meant to talk about the just living by the FAITH of an end-times figure who is a man of pride whose spirit was not right within himself and who tries to draw all GENTILES / NATIONS to himself in competition with God. The man's faith (i.e., Jesus is Messiah, Son of God) is right, as we shall see, but his mission was adverse to God. This vision is for a future time. It describes the end, and it will be fulfilled. for it will surely take place. Thus, before we study this passage, realize now that how you have been trained to read it is based upon none other than Paul's misreading of the context. How interesting then that in context, this appears to be a prophecy about Paul -- and even, as we will see, identifies the person's name as SAUL --- that is, the Hebrew letters SHL identify the one whom draws all "GENTILES / NATIONS" to himself in competition with God. Thus, prayerfully examine whether this prophecy is actually a prophecy about Saul-Paul -- the self-proclaimed Apostle to the Gentiles. First, let's study the name Saul. To understand this, we need to know in ancient Hebrew, the vowels are not used. Thus, the name Sheol and Saul in ancient Hebrew were written identically, and were distinguished only by context. While it may be a coincidence, Strong's does establish that both Saul and Sheol come from the same root word. Saul is a passive participle of the word numbered 7592 in Strong's system. And Sheol, the grave, is "from 7592," Strong's says. Thus, Saul and Sheol have an identical derivation. If one sees other more serious and blatant problems with Paul, then this name association of Paul with Saul and then by etymological association to Sheol may be a spiritual hint from our Lord. It alone proves nothing. Habakkuk 2:5: Does It Mention Saul-Paul? However, one Paul critic says that the sh'l in Habakkuk 2:5 now could be translated as Saul, not Sheol/hell/grave. In 2:5, with this change, the verse would say: "Yea, also, because he transgresses by wine, he is a proud man, neither keepeth at home, who enlarges his desire as SAUL [sh'l] and is as death, and cannot be satisfied, but garnereth unto him all nations [i.e., GENTILES], and heapeth unto him all people." If God did prophesy in one more place about Saul-Paul, we must listen. Let's now look at the broader context to see whether the passage as a whole is about Saul-Paul. As we read, bear in mind the passage states a vision experienced by the prophet Habakkuk. It was not a discussion of someone then alive in 610 BC. b) whose "soul is not right within him"
h) in rebuttal to the "haughty one," God says He is in His holy temple (v. 20). I Corinthians 14:18 I thank my God, I speak with tongues more than ye all. II Corinthians 11:23 Are they ministers (i.e., the 12 apostles) of Christ? (I speak as a fool) I am more; in labours more abundant, in stripes above measure, in prisons more frequent, in deaths oft. Wouldn't a normal humble Christian be upset anyone mistook them as an angel or even as the Lord Jesus Christ? I think we would all be unhappy rather than pleased and complimentary to others who did so. Hence, this is just another example -- among many -- of Paul's pride -- a sin he admitted he had trouble controlling. Hence, Paul was a man of pride by (a) contradicting Christ (1 Tim. 6:3-4); (b) boasting (1 Cor. 15:10; 2 Cor. 10:8; 11:16-22); and (c) by flattering himself in several ways -- (1) that he was commanded to be the "light of the Gentiles" in Isaiah 49:6 when instead the passage meant Christ alone was to be made by God the "light for the Gentiles;" (2) that Paul was "crucified unto the world" which is only true of Christ Himself; and (3) that some mistook Paul as an angel or even as Christ Jesus Himself (Gal. 4:14) when one should forsake any inadvertent pleasures from such misunderstandings. If there still yet be any doubt, please also see our webpage Did Paul Have An Enormous Self-Image? B. A Soul Not Right In Himself? The most important proof is Romans 7 where Paul says he is constantly beset by sin. While some resist this, the most straightforward reading of Romans 7 is that Paul admitted he was a carnal Christian. The main reason is Paul spoke in the present tense, and not about his past life. Paul says. 15For that which I do I allow not: for what I would, that do I not; but what I hate, that do I. 16If then I do that which I would not, I consent unto the law that it is good. 17Now then it is no more I that do it, but sin that dwelleth in me. 18For I know that in me (that is, in my flesh,) dwelleth no good thing: for to will is present with me; but how to perform that which is good I find not. 19For the good that I would I do not: but the evil which I would not, that I do. 20Now if I do that I would not, it is no more I that do it, but sin that dwelleth in me. 21I find then a law, that, when I would do good, evil is present with me. 22 For I delight in the law of God after the inward man: 23But I see another law in my members, warring against the law of my mind, and bringing me into captivity to the law of sin which is in my members. 24O wretched man that I am! who shall deliver me from the body of this death? 25I thank God through Jesus Christ our Lord. So then with the mind I myself serve the law of God; but with the flesh the law of sin. I believe this...view [of Luther, Calvin and Augustine] is correct, mainly because Paul continues to write in the first person singular but in the present tense. It seems most natural to understand this section as Paul talking about what he was then experiencing. Id. at 142. Incidentally, this literal and traditional view was then used in our era to argue in favor of eternal security despite living as a carnal Christian. 'If Paul could do it, then why not me too?,' so went the argument. Hence, based upon Romans 7:14-24, if Paul lived a very carnal sinful Christian life, and was saved, so we too can live. Redpath, for example, said in reliance partly on Romans 7:14-24: “The carnal Christian is a child of God, born again and on his way to heaven, but he is traveling third class.” (Redpath). Thus, this terrible example of Paul's morally conflicted life continues to harm the church. More important, if read literally which is the traditional reading, then by Paul's own words, once more, we prove his soul was not right in himself. Next, shall the righteous live by the faith / steadfast beliefs Paul had? Yes! Paul believed Jesus was Messiah and Son of God. It was only in Paul's letters where he incorrectly taught a DOCTRINE about the impact / effect of such FAITH --- that it allowed him to be righteous without obedience to the Law, and, in most interpreters' eyes, without repentance and continuing obedience to any standard of righteousness. This was Paul's DOCTRINE about FAITH, but it was not his FAITH itself. Thus, when we apply Habakkuk 2:2-5 to construe what aspect of Paul's beliefs the just must live by, it is Paul's belief in Jesus as Messiah and Son of God -- HIS FAITH -- and not his licentious lifestyle of haughtiness and pride evidently arising from his doctrine about the EFFECT of his faith. Hence, Paul's faith as documented by Luke is the same as the apostles' faith / beliefs about Jesus. John concludes his gospel by stating his aim was that we believe Jesus was Messiah and Son of God. (John 20:30-31.) The righteous thus shall live by the faith of the proud man whose spirit is not right within him. Obviously, that faith does not make that proud man whose spirit is not right within himself truly justified in God's sight. But the righteous / just must live by the faith Paul had even though Paul admitted for himself it did not allow him to conquer sin in his own life. Next, this passage says this haughty one does not stay at home. Paul indeed traveled extensively. He had no home life. While such travelling does not make one a sinner, for neither did Jesus nor any of the 12 have a true home life to speak of, we are following the lead of Habakkuk 2:2-5. We are identifying the multiple traits of this prophesied figure in Habakkuk 2:2-5. This travelling trait fits Paul too -- and is always regarded as one of his most characteristic traits, e.g., "the missionary journeys of Paul," etc. And the passage continues -- he enlarges his desire as SHL -- as SAUL? or as Sheol? the grave? We discussed the connection above. This is for the reader to prayerfully contemplate. It can be understood either way, and I believe this is intentional. It is a prophetic word-play here in Hebrew, using a word identical to the name of the HAUGHTY MAN, the ONE WHOSE SPIRIT IS NOT RIGHT IN HIMSELF, etc. "He enlarges his desire as SAUL" -- the name he would go by -- is just as important to hear as "He enlarges his desire as SHEOL (the grave)." Thou art filled with shame, and not glory: drink thou also, and be as one uncircumcised; the cup of Yahweh's right hand shall come round unto thee, and foul shame shall be upon thy glory. Habakkuk 2:16. / be uncircumcised (YLT). Clearly the episode in Acts 21 shows Paul was circumcised. This proud man whose spirit is not right in himself has to be a circumcised person for this coming judgment on him to fit. Why is this a rebuff to Paul specifically...this man of pride? "However, the God who made the world and everything in it does not live in temples built by human hands." This is of course false Biblically. God's House was the Temple at Jerusalem, as even our Lord Jesus repeatedly said so. Thus it is interesting to see how this passage ends with God affirming the opposite of what Paul taught -- affirming instead that He, God, indeed does live in a Temple made of human hands. It is intended as a rejoinder to this haughty man - whom we see said the opposite. This verse thus too addresses Paul. Like Messianic prophecies, sometimes it takes time to let the traits sink in and then one sees a match. The double-meaning of SAUL's Hebrew name, and the dual use of SHL in this passage, are both intriguing once one looks at all the other similarities in the passage to Paul. God through Habakkuk tells us Paul had the right FAITH, and we shall live by HIS FAITH, but Paul was a proud man due to his conflict with the words of Jesus. His spirit was not right within himself, as Paul's own words prove. This is also demonstrated by the haughty remarks which fill his letters. Thus, outwardly Paul had the right Christian appearance -- the right expressed Faith or Beliefs about Jesus -- but inwardly "his spirit was not right within him." And this was the vision that Habakkuk had in this prophetic passage. This fits precisely our concern that Paul failed to heed Jesus' warning not to believe that after the Ascension anyone you meet in the wilderness who claims to be himself -- Jesus -- as Paul experienced in Acts 9:1-7 and trusted. If we are correct Paul was an innocent dupe of that self-professed "Jesus," this means Paul's faith could be correct -- Jesus is Messiah and Son of God -- but his spirit is not right in himself because the "Jesus" Paul is following is an imposter, just as Jesus warned about in Matthew 24:vv. 4-5, vv. 24-27. See our discussion of proofs this happened at this link. Finally, Paul matches this prophecy because he gathered all the nations to himself. This is still an ongoing process to this day. A vast number are following Paul, assuming wrongly he comes with the Master's teachings to follow. The prophesied punishment of this end-times figure is to be rendered as an uncircumcised Son of Isreal who disobeyed Lev 12:1-3 and suffer accordingly. It does appear therefore that this is another passage that God gives us as a prophecy about Paul -- not a flattering one. God always provides warnings for His people to hear if we but listen. In Isaiah 28:18, God speaks of people who have a "covenant with SHL," typically translated as SHEOL or the grave. The people falsely believe this covenant will protect them from "the whip when it passes through." This means these covenant-people believe their covenant with SHL gives them salvation / protection from God's wrath. Then these people whose prophets and leaders are apostate against God's Law are at odds with what God describes as something He ALREADY LAID as a "chief cornerstone" in Zion. (Isaiah 28:16; see below.) "Behold I am the one who has LAID as a foundation in Zion....a precious cornerstone." This cornerstone is Christ, as Jesus / Yahshua made clear in Luke 20:17. The message then would be those relying upon a covenant with Paul / Saul, not the one renewed by the chief cornerstone Yahshua with Yahweh, have a false hope. God describes it as a covenant with death. God directed Paul to Habakkuk 2:4 to read it as a warning about what Paul had become. But Satan blinded Paul to not recognize this is not a statement about a salvation principle -- "the just shall live by his faith" -- with "his" being a supposed reference to the penitent's faith. Rather, the "his" in "his faith" was about this man of pride who goes on missionary travels to gather the nations (Gentiles in Hebrew) to himself but whose spirit is not right within himself. This is a warning about the deception by this man of pride yet whose faith was correct. How ironic that Paul quotes Habakkuk 2:4 twice (see Romans 1:17 and Galatians 3:11) without realizing it was a prophecy about himself. Paul was a blind guide as to this passage's meaning. Paul here mistook Habakkuk 2:4 as a doctrinal principle about salvation of 'justification by faith.' And all of us have likewise misread 2:4 by not reading the context of the verses surrounding it. In context, 2:4 was part of a warning about a prophesied figure whose faith the just shall live by but this figure would (a) be a proud man; (b) whose spirit was not right within himself; (c) who would try to gather all the nations (i.e., Gentiles) to himself; (d) on his many travels far from home. Who but SHL (Saul) can this prophecy identify? One can see the Ebionite community linked the Wicked Priest and the Spouter of Lies together as fulfiling Habakkuk 2's prophecy of a "proud" person who gathers the "spoil from the nations" and were enemies of the "Teacher of Righteousness." Again, I believe Eisenman mistakes James as this teacher when it was truly Jesus. Eisenman does correctly, I believe, interpret the Ebionites as identifying Paul as the Spouter of Lies in this Habakkuk Pesher for reasons explained in my book Jesus Words Only. Hence, in effect, the Ebionites saw both the Wicked Priest and the Spouter of Lies (whether Paul or not) as fulfilling Habakkuk 2:5 as the man whose spirit is not right but gathers all the Gentiles / Nations to himself. The Dead Sea Scrolls therefore show that others have previously tested Habakkuk 2:5 as a prophecy about a dangerous end-times figure, and not as a spiritual principle about salvation by faith. And if Eisenman is correct the Ebionites were the Poor at Jerusalem under James, suggested by Paul's reference to collecting for the Poor (EBION in Hebrew) at Jerusalem under James' authority, then our reading of Habbakuk 2 goes back a long ways in the history of the Christian Church -- it was first advanced by the Ebionites in the 1st Century. Some claim because Habakkuk chapter 1 specifically prophesizes about the Chaldeans (Babylonians) that this is whom Habakkuk 2 is talking about. (Tyndale Concise Bible Commentary at 362.) It says the "proud" of 2:4 was already "alluded to" in Habakkuk 1:10-11 which speaks of the Chaldeans. It also changes "his faith" into "their faith," and claims the faith is of the "godly of Judah." But there are several incongruities to this explanation. Habakkuk 2 starts by a new vision, and this time it is an individual, not a nation, identified as full of pride. 10And they shall scoff at the kings, and the princes shall be a scorn unto them: they shall deride every strong hold; for they shall heap dust, and take it. 11Then shall his mind change, and he shall pass over, and offend, imputing his power unto his god. The alleged allusion is to the pride of those who scoff at kings. This is in the plural in 1:10, but a singular figure in Habakkuk 2. Verse 11 begins to change to "his" but still does not speak of any single individual who is prideful so it could be linked to the later vision in Habakkuk 2. Also, the "faith" of this prideful individual in chapter two is the faith by which the just shall live, even though the "heart is not right within" this prideful man in Habakkuk 2. So this cannot be the same person as in 1:11 who has a wrong faith in another god which faith the just could never live by. Finally, the figure in Habakuk 2 is circumcised and his punishment is to become as one uncircumcised. Chaldeans were an uncircumcised nation. Hence, Habakkuk 2:4 is not a reference to the Chaldeans. As anyone can see from these two examples, not only does Habbaquq hint of Paul but literally spells out his name (and this is simply one set of examples---there are countless others). There are literally scores of other examples found throughout the TaNaKh as well as the Gospels when rendered in Hebrew. I am certain that The Holy One, blessed is He has led you to these conclusions that many of us among the Jews have seen for centuries (though mostly by accident). Happy hunting! P.S. If I can be of any assistance in your research please feel free to e-mail me. I read Hebrew, Aramaic, some Coptic, Greek and Latin. Yada Yahweh on Habakkuk Applying to Paul (YouTube 11/28/2014) - Yada does detailed exposition on Hebrew words using Dead Sea Scrolls version of Habakkuk, and applies to Paul as fulfilling. We read that Paul's Hebrew name of S'Aul was "consonantally named in the Book of Habakkuk (which, recall, didn't have diacritical vowel marking ascribed to it until absolutely no earlier than the 6th century C.E., and possibly not until the 10th or 11th century)...." See link at page 4. The fact Paul's Jewish name is Saul and he comes from Tarsus itself may be more than a coincidence. It can be another message from our Lord that Paul is not what he appears to be. Tarsus was identified with Hell in ancient Greek mythology. Outside of Tarsus -- about 65 miles -- across a desert were two caves separated by 100 meters / 328 feet. One is called Heaven and the other Hell. They figured prominently in Greek mythology of Paul's day. In Greek mythology, the myth of Zeus was that he was trapped in a cave called Heaven which was in the vicinity of Tarsus -- 65 miles (conversion from km) or 105 km away. (There was a desert between Tarsus and this cave of Heaven.) Zeus escapes and then puts Typhon into the adjoining pit of Hell (328 feet from the Cave of Heaven) -- similarly near Tarsus, until Typhon burrows in the earth and explodes in the volcanic eruption in Mt. Etna. 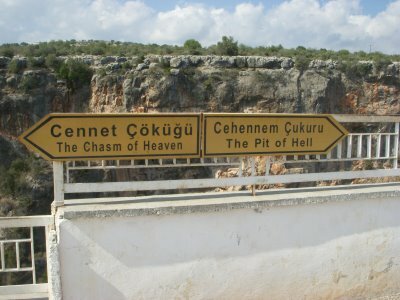 The Cavern of Hell (Cehennem), 100 meters uphill from Heaven, is a smaller depression with steeper sides, 30 meters in diameter and 120 meters deep. Luckily, its walls are too steep to allow access, so you can't descend into it (in other words, you can't Go To Hell). Of course, the two caves figure prominently in ancient Greek myths, according to which Typhon, a fire-breathing 100-headed dragon, battles Zeus, king of the gods. Zeus is defeated and imprisoned in these chasms. Hermes and Pan rescue Zeus, who goes after Typhon again, defeats him and buries him in the earth, but Typhon's fire-breath issues from the earth as what we know as Mt Etna, the active volcano in Italy. Heaven & Hell, situated on a large hill north of Narl?kuyu, consists of the grabens result from assoil of furrings for thousands of years. Natural phenomena of the grabens is named 'Hell & Heaven' because of the exotic effects on people. From an ancient path, 260 meter long mythological giant Typhon's cave can be accessible.